You guys. I’m so embarrassed. I created this mini shakshuka for two post ages ago, and somehow I’m only just now hitting publish on it. But no better time to post a perfect brunch recipe then right before the weekend, right? Speaking of things I’m behind on, would you believe me if I told you I hadn’t even eaten shakshuka until more recently??! Like two years, recently, but still… I had no idea the goodness I was missing out on! One of my favorite parts of making shakshuka is how customizable it is, from the sauce you cook the eggs in to the herbs you top it with to the bread you serve it with. And while this recipe makes just two mini servings, you can easily double or triple it to serve a crowd. I’m certainly not giving up my eggs benedict anytime soon, but it’s definitely nice to switch it up every once in a while, especially to something that’s as healthy, fresh and flavorful as shakshuka is. Set a large skillet or pot over a burner turned to medium-high, add the olive oil and allow to heat for a few minutes. Toss in the onions and sauté until they’re translucent, about 5-7 minutes. Then stir in the jalapeno and garlic and continue sautéing for 2-3 more minutes. Once the vegetables have browned, add in the remaining sauce ingredients. Stir to combine, turn the heat down to low, partially cover the pan with a lid, and allow the sauce to simmer for 30-60 minutes (the longer it cooks the better the flavor gets), making sure to stir occasionally. About 15 minutes before you’re ready to assemble the shakshuka, make the pita crisps. Preheat the oven to 400 degrees. Spread the pita pieces in a single layer on a baking sheet. Drizzle with sesame oil and season with za’atar and salt. Bake for 7-10 minutes, or until the edges turn golden brown. Remove and set aside. Keep the oven at 400 degrees while you assemble the shakshuka. Divide the sauce equally between 2 large ramekins (or mini pots, cast iron skillets, etc). Use the back of a spoon to gently press some of the sauce away from the center and up the sides, forming a “hole” for the egg. Crack an egg into each indentation, then sprinkle each dish with half of the feta cheese. 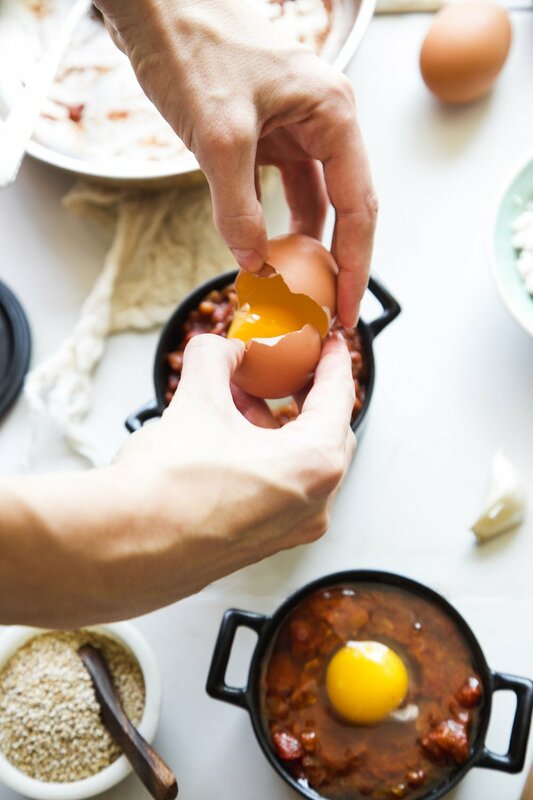 Bake for 20-25 minutes, or until the feta has turned golden brown, the egg whites are firm and the yolks are cooked to your liking (baking time will depend on your oven and baking dish). Drizzle with a little sesame oil, garnish with herbs/seasonings of your choice and serve immediately with plenty of pita crisps on the side.